When the Republican Party defeated its fellow ruling-class party, the Democrats, in the November midterm elections, liberals and not a few would-be leftists groaned in exasperation. How could this happen? How much worse will things get? Surely the Republicans will go after any remaining shreds of rights for women and minorities, imposing a semi-fascist hell. And, they claimed, young people who couldn’t bring themselves to vote for either of the discredited parties of Wall Street were to blame for the Democrats losing control of the Senate in addition to the House. As the election campaign got down to the wire, the Democrats appealed to their base, desperately trying to get out the black and women’s vote. Investing heavily in the issue of women’s rights, they ran candidates like Wendy Davis for governor in Texas, who got headlines in 2013 for holding an eleven-hour filibuster to block anti-abortion legislation. Mark Udall in Colorado was demonized by the right wing for campaigning for over-the-counter access to birth control and opposing his Republican opponent’s call to outlaw abortion altogether. Both lost. The post-election lament over the Democrats’ loss ignores the hellish conditions that already exist in this country for millions of African American, Latino, Asian, and immigrant workers and youth. Attacks on women’s basic democratic rights have accelerated with Obama in the White House, and not just because the Republicans are determined to undermine the Democrats. Every single state has recently passed anti-woman laws. The root of this recent wave of racism and misogyny is in the capitalist system itself, and comes from the bosses’ parties. There has indeed been a slew of legislative measures against women lately – 231 state laws restricting abortions in the last three years alone, according to the Guttmacher Institute. That’s more than at any time since the Supreme Court established a constitutional right to abortion in the 1973 Roe v. Wade decision. Access to birth control and reproductive healthcare has been systematically shredded. In Texas, the number of abortion clinics is down from 42 in May 2013 to 20, and may soon fall to seven if an appeals court lifts a temporary stay on the Texas HB-2 law. Among the clinics that would be closed is the last clinic in the Rio Grande Valley, one that serves mainly Mexican and other Latina women. Those that would remain are in wealthier urban areas, underscoring that working-class women are the primary targets of anti-abortion legislation. According to the RH Reality Check news site, it would cost a woman worker in the Valley over a month’s wages to travel to the nearest clinic in San Antonio. This is a life-and-death matter: for low-income women in many parts of the U.S., it is back to coat-hangers and bleach. With abortion rights under siege, women have an equally difficult time accessing safe and effective birth control. Many insurance policies will not cover contraceptives, and under Obama’s “Affordable Care Act” as before, many poor and working women do not have health insurance, and cannot afford any form of birth control or reproductive healthcare. The maternal mortality rate in the U.S. is sharply increasing – up 70% from 1999 to 2009 – and is almost four times as high for black women as for whites. Last year, 1,200 women died in childbirth in the United States, making it next to last among economically advanced countries in the OECD. As one commentator noted, the majority of young women in the U.S. are busy working, with seven out of ten college graduates paying off student loans averaging $30,000, among other bills; one in five will be sexually assaulted or raped during her life, and upwards of 300,000 teenagers give birth every year – hardly a picture of young women “without a care in the world” aside from their Tinder or Match.com profiles. The Democratic Party, while appealing for women’s votes, regularly ducks “hot button issues” and quickly backpedals under attack. In New York, Democrats tried to put a pro-woman gloss on their campaign ads, touting a state “Women's Equality Act.” This infuriated the right wing for permitting third-trimester abortions should a woman’s health be in danger. But as soon as the elections were over with Republicans still in control of the Senate, the WEA became a dead letter, just like previous bills for in-state tuition for undocumented immigrant students. As revolutionary Marxists, we in the CUNY Internationalist Clubs fight for women’s basic democratic rights, including the fundamental right to control their own reproductive systems. We are for free, high-quality abortion on demand, with the decision being hers and hers alone. As Latin American women activists chant, “Nosotras parimos, nosotras decidimos” (we give birth, we decide). While capitalist politicians hack away at these basic democratic rights of women, the Democrats “triangulate” by posing soft-core versions of Republican policies, and then cynically trying to get votes as defenders of women. A prime example is Hillary Clinton, who in her husband’s administration played a leading role in designing the 1996 bill to “end welfare as we know it.” She and Barack Obama hail this as “greatly beneficial” in dumping a “divisive” issue. Not so beneficial, though, for the millions of African American, Latina and white poor and working women thrown off AFDC (Aid to Families with Dependent Children). Or consider Hillary’s sponsorship of the Caracol industrial park in northern Haiti. Largely funded by the U.S. Agency for International Development and the Inter-American Development Bank, the project siphoned off millions of dollars of relief money from the hard-hit earthquake area at the other end of the country. 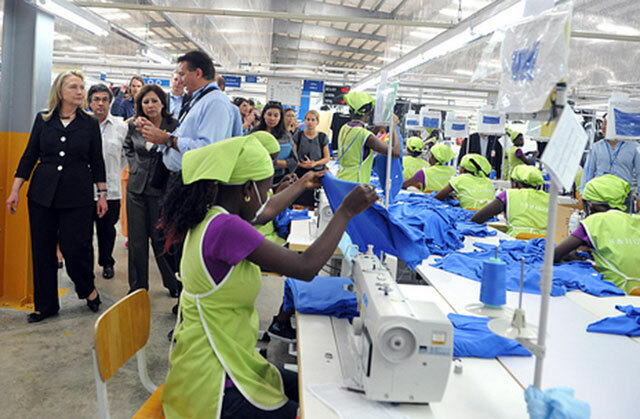 The “park” includes a big sweatshop garment factory with over 1,200 women workers paid an average of $4.67 a day. That’s less than the legal minimum wage, way less than enough to raise a family, lower than average wages in Haiti and the lowest-paid of all the garment plants in the country. What is behind the Democrats’ faux-passionate appeals to “feminism” and women’s rights? The Democratic Party poses as the “friend” of women, labor and every oppressed group in order to control their struggles in the interest of capital. Democrat Obama can sell imperialist war, capitalist austerity and privatization to the masses better than Republican Bush. And the bipartisan war on women goes hand in hand with the war on workers, on immigrants, on public education and for world imperialist hegemony. We haven’t come such a long way after all, and life is definitely getting worse for poor and working women. Genuine equality and full emancipation for women will not be achieved by feminism, a bourgeois ideology that claims all women (both exploited women workers and exploiters like Hillary and her ilk) are sisters, or the bourgeois electoral circus, but through revolutionary class struggle of working women and men leading all the oppressed. It will take the working class organized in its own party – independent of and against all the capitalist parties – to stop the descent into barbarism, by seizing control of society from the reactionary bourgeoisie. 1.See “Haiti: Women Workers Strike Against Starvation Wages,” The Internationalist No. 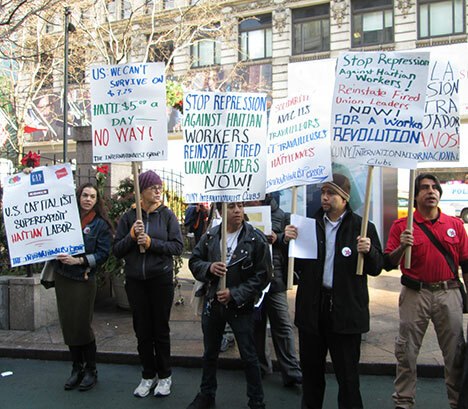 36, January-February 2014 (http://www.internationalist.org/haitiminimumwage1312.html).